UK TimeBanking turns 20!St Neots Timebank UK TimeBanking turns 20! /News /UK TimeBanking turns 20! 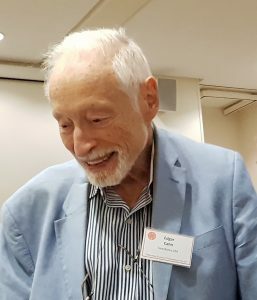 It all started in the USA with Edgar S Cahn, the creator of Timebanking, who is a distinguished legal professor, former counsel and speech writer to Robert F Kennedy. There are now Timebanks in 22 countries throughout the world. Martin Simon founded the first TimeBank in England in 1998 and became the Chief Executive of TimeBanking UK (the mother organisation of 250 timebanks throughout the country). The 20 year anniversary was celebrated at a conference at Brunel University, Uxbridge. Attending was Edgar Cahn (aged 83), with Christine Gray, who came over from the USA especially to celebrate the occasion, along with TimeBank Co-ordinators from Italy, Spain, Japan, Portugal and, of course, England. Patron of TBUK, Lord Colin Low of Dalston opened the Event with a keynote address, and David Boyle, TB Author and co- founder of the London TB, along with Robert Buckland MP QC, addressed the meeting. TimeBanking is based on the principle that a person gives one hour which equals one hour of help in return. Help is repaid when a skill you have is requested. To work well, people need to ask for assistance as well as to offer. The two days of workshops and celebrations included the launching of a new Database called Timeonline2 and a ‘Home from Hospital’ project which, with the help of volunteers, will free up hospital beds. 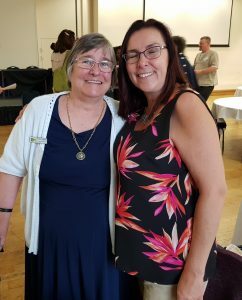 St Neots TimeBank’s co-ordinator, Georgina, was invited to Brunel University in Uxbridge where the event was taking place. This was a great opportunity to display the successes and achievements of the St Neots group, and learn about other Timebanks’ progress. The story of one of our members, who suffered from deep dark periods of depression, was chosen to be featured in the event booklet as an example of the benefit and power of Timebanking. Georgina gave a talk, briefly describing how the St Neots TimeBank started in March 2012. This was well received and led to Edgar Cahn requesting the full story of what inspired the formation of the St Neots TimeBank and how it all started, for inclusion in a book that he is writing on the subject. This is a great compliment for Georgina and the whole Team. The final surprise for Georgina the coordinator (now aged 73) was to be recognised as the founder of one of Timebanking UK’s top TimeBanks. The St Neots TimeBank has an Advisory Team that helps organise all our events, so this award was also recognition for the help they have given to make our TimeBank what it is today. It has reached a total of 214 members, so far, with 7,380 recorded hours of exchanges given. The aim is to help those who either can’t or don’t know how to do something or are just too busy. In other words, making people’s lives less stressful whilst also alleviating loneliness by having someone available at a time of need. 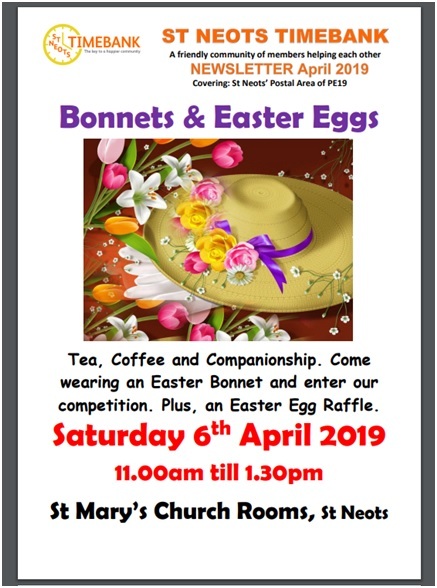 St Neots TimeBank holds regular coffee mornings on the first Saturday of the month – each with a different theme. These are held at St Mary’s Church Rooms from 11am til 1.30pm. We also invite people to drop in for a chat and meet members at our New Friends group at the Priory Centre on the third Friday of the month, from 11am till 12.30pm. For further details, subscribe to the free monthly Newsletter, which is also available via our Facebook, Twitter and web pages.